Bees feed on nectar for energy and pollen for nutrients. Bees have a long tongue-like appendage that enables them to obtain nectar from flowers. The best-known bee species is the Western Honey Bee. Unlike most bee species, the Western Honey Bee produces honey. Pheromones are used by queen bees to regulate hive activities and worker bees also produce them to communicate. The collecting bees store the nectar in a second stomach and return to the hive where worker bees remove the nectar. Worker bees then digest the raw nectar for roughly 30 minutes to break up the complex sugars into simpler ones. Raw honey is then spread out in empty honeycomb cells to dry. When nectar is being processed, honeybees create a draft through the hive by fanning with their wings. Once dried, the cells of the honeycomb are sealed with wax to preserving the honey. When a hive detects smoke, bees become non aggressive. This is probably a defense mechanism; wild colonies generally live in hollow trees, and when bees detect smoke it is presumed that they prepare to evacuate from a forest fire, carrying as much food reserve as they can. In order to do this, they will go to the nearest honey storage cells and gorge on honey. In this state they are quite docile since defense from predation is relatively unimportant; saving as much as possible is the most important activity. Africanized honey bees release a pheromone when attacking which is what signals other Africanized bees to attack as well. While the Africanized honey bee's sting is no more potent than that of the traditional bee, in large numbers the venom will overwhelm the body. When License-To-Kill is contacted to exterminate bees we typically schedule the treatment early in the morning or very late at night. By planning our treatment at these times, we are able to ensure that all of the bees are in or immediately around the hive. 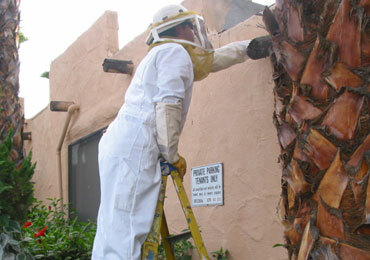 In most homes, we open a 10’ x 10’ area, removing the bee hive, damaged insulation and framing materials. Our skilled carpenters are capable of opening up nearly any area in your home and can fully restore the affected area to look new again. This process is the best way to remove and eliminate further bee problems. Based on your infestation and construction costs, License-To-Kill will evaluate your bee infestation and schedule a time for removal. Your service technician will exterminate the live bee colony and seal all entry points with caulk, foam insulation or other materials as deemed necessary. Please note that this process cannot be guaranteed to remove all bees due to the fact that the infestation may have multiple sources, or the chemical treatments may not fully penetrate the beehive. Occasionally the hive will be located outside the structure in a tree, barbecue, sprinkler box or other unique areas which are simple to control. 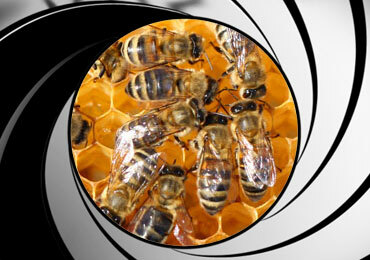 In these cases, your License-To-Kill technician will be able to remove the bee hive. Get Rid Of Your Bees Today!